Google and Zoho aren’t the only companies making waves in the online office race. 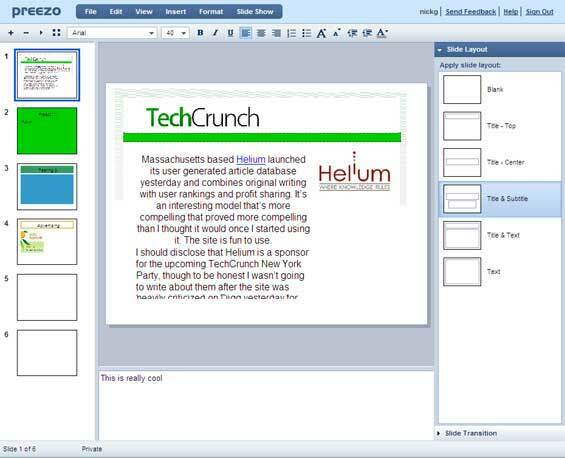 New startups are launching regularly that emulate one or more products in Microsoft’s Office suite. Preezo just threw their hat in the ring with their soon-to-be-released PowerPoint clone. We’ve tracked a number of these products, including Zoho, Empressr, Thumbstacks. We’ve also tracked a few companies that just handle putting the presentation online after creation with a desktop application – our favorite is Slideshare, which lets users upload PowerPoint presentations to a YouTube like service. Preezo clones the PowerPoint interface very well (see screen shot below), and assigns a permanent URL to the presentation. Presentations can also be embedded into other websites. At this point though it’s more of a demo than a working product. Only a few users have been let in to test it, there is no import feature to upload PowerPoint files and there are no tools to create animations or drawings. These are all features that are being built, but there’s no release schedule. What’s most impressive about Preezo is that it’s the creation of a single developer, Jason Roberts. Given the number of established competitors in the market already, I wouldn’t be surprised to see Jason quickly join a bigger company. If that’s the case, Jason just built himself one hell of a resume. Sign up on the Preezo home page to be notified of launch. Or, perhaps more likely, get news of Jason’s future employment on the Preezo blog.